Root canal therapy (“Endodontics”) is a dental procedure that involves making an opening in the chewing surface of a tooth and removing the infected pulp tissue within that tooth. To be successful, it requires the precise cleaning, disinfecting and shaping of this tissue in the affected tooth and the space (the root canal) in which this tissue resides. Once this is accomplished, the root canal is tightly sealed so that no bacteria can enter and re-infect the tooth. Your regular dentist and Endodontist may then recommend a permanent restoration, such as a crown, which is necessary to improve the appearance, function and stability of the tooth. 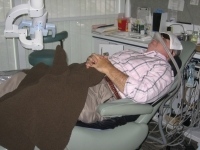 Root canal therapy is quite common. Over 21 million teeth undergo Endodontic therapy each year. While the basic Endodontic concepts have remained fundamentally unchanged, we are constantly improving and upgrading our equipment, as well as mastering advanced current techniques. Root canal therapy makes sense for a number of reasons. Depending on the location of the tooth, it may be critical to your mouth in ways that you rarely think of, such as in eating or esthetics. It may also serve as an anchor for a crown, bridge, denture, or dental prosthetic appliance. Since root canal therapy preserves the bone that could be lost from a dental extraction, you will also be maintaining the health of your jaw. Cosmetically, a tooth that has been treated with root canal therapy and the appropriate dental restoration will look the same as your natural tooth after the treatment. Therefore, your appearance will not be affected. After root canal therapy, for all intents and purposes, your tooth will function similarly to other teeth in your mouth. You will not have to worry about chewing or biting on that side of the mouth, and the tooth will appear the same or better than it did before the root canal. Patients who have had root canal therapy are able to keep the affected teeth in their mouth for as long as other natural teeth, and further problems are quite rare. 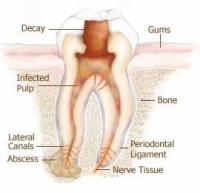 Your dentist has determined that the nerve inside your tooth has become injured or infected. This can be caused by many things, including deep fillings, extensive decay, trauma, or periodontal factors. Once the nerve is infected or injured, it begins to deteriorate and release toxins. These toxins irritate the nerve, can cause pain, and may ultimately infect the jawbone and lead to a breakdown of the tissue supporting your tooth. If the infection is not treated accordingly, then you may experience extreme pain, lose the tooth, or could become very ill. In addition, extracting the infected tooth can result in additional expenses, such as crowns, bridges or even dental implants. Infected and injured teeth may cause you sensitivity to hot and cold foods or liquids and may be sensitive to touch or bite. They can awaken you at night with severe pain. You may also have intermittent or prolonged episodes of pain and throbbing. It is also possible that your gum, near the end of the affected tooth, may swell or become sensitive to touch. Not the way that we perform the procedure! We have many means (including potent modern dental anesthesia, nitrous oxide gas and medication, alone or in combination) to immediately alleviate the pain that you are experiencing from an infected tooth and to prevent you from feeling any discomfort during the root canal procedure. After your visit, you might experience some tenderness to chewing or touch for a few days. However, this is considered normal and, if necessary, you will be given the appropriate medication to deal with this sensitivity. The cost of root canal therapy is dependent on how severe your problem is as well as the number, location and shape of the canals in the infected tooth. No two teeth are alike and all situations are different. Therefore, it is necessary to evaluate the offending tooth with dental x-rays and pulp testing procedures before an estimate can be given. This can only be done in our office, so we cannot accurately determine the cost of your root canal procedure over the phone or the internet. Your insurance company may reimburse you for some or all of the cost. Before you leave our office, we will provide you with a completed insurance claim form, so that your claim can be expedited as quickly as possible.